Leave it behind for the others! The Harding Icefield is an entire mountain range covered with several thousand feet of ice. Each year, hundreds of feet of fresh snow accumulates on the icefield and is compacted into dense glacial ice. 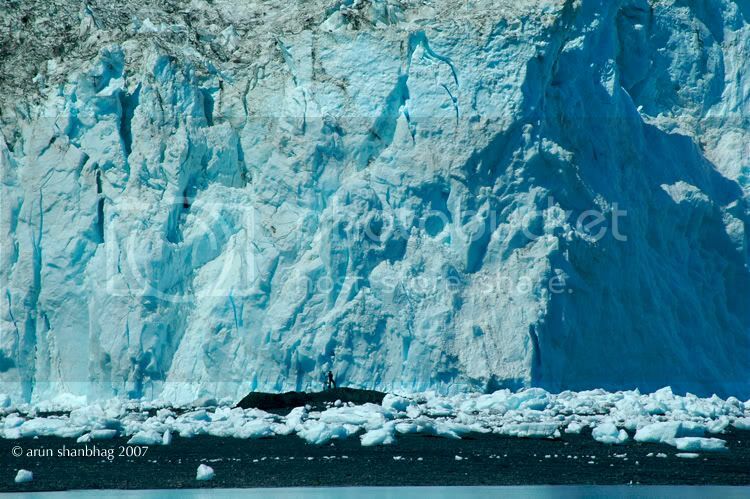 The river of ice slowly creeps out between the mountains creating the deep fjords and ending in several tidewater glaciers, like the one pictured here. As the river of ice advances, huge chunks of ice crash (or calve) into the bay. 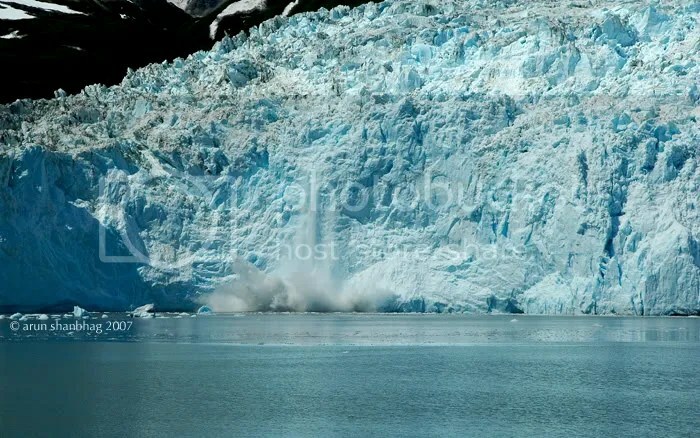 Crashing chunks of ice stirs up the plankton in the bay, which in turn attracts schools of fish, hungry birds and whales. Look at the ice chunks crash into the bay. They appeared tiny coming down, but the sprays suggests otherwise! 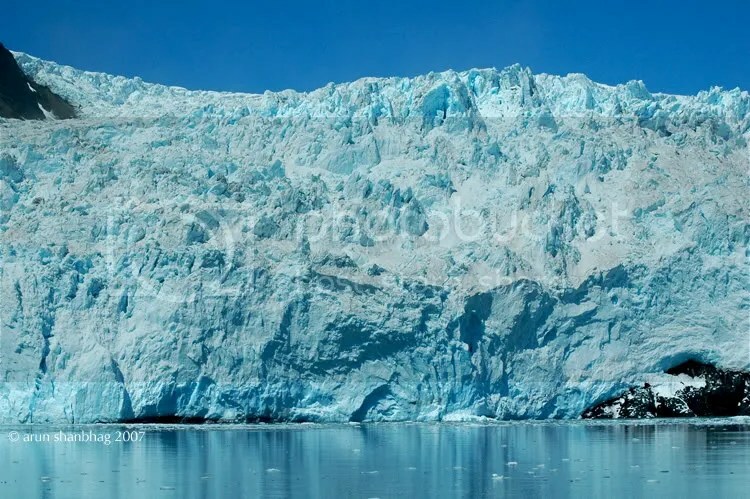 Our boat was parked 300 ft from the face of the glacier – thats how tall it is and by regulations, the boats have to be that far away. 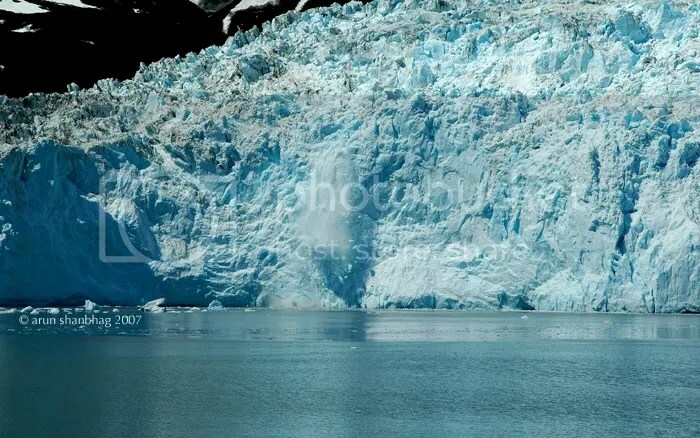 The glacier was a mile wide and I could not get the entire face in one shot, till we were leaving the Bay. For nearly 45 minutes, we gazed at this beautiful vista. We could hear the deep rumbles, groans and squeaks as the ice shifted. A living breathing giant. What an impressive sight and experience! We had to be quite far away to get a complete view of the Aialik Bay Tidewater Glacier. Enjoy! Hope you are enjoying New Year’s Eve!